Saturday, June 8, 2019: details to come! Saturday, October 12, 2019: 11am to 4pm on Railroad Avenue in Warwick, NY. See website for directions, rain location, and more. March 6, 2019: Moved and updated upcoming appearances, added note to editing page, added CURSE OF THE EVIL LIBRARIAN cover to home page, finally added Revenge of the Evil Librarian info page, and made other small tweaks throughout. December 5, 2018: Updated 2019 school visit rates and info. Hi and thanks for visiting! This site contains information about me and my work. I'm the author of more than forty-five books for young readers of all ages. I'm also a freelance children's book editor and writing coach (see my editing page for rates) and a member of the MFA faculty in the Writing for Young People program at Lesley University. See side columns (or scroll down, if you're on your phone) for upcoming events and appearances and to learn how to order a signed book! 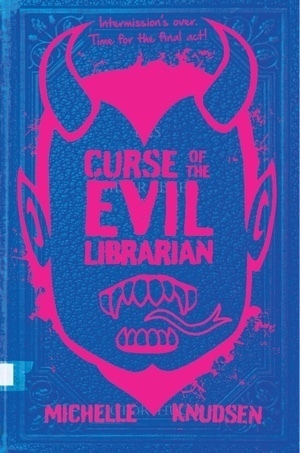 CURSE OF THE EVIL LIBRARIAN! CURSE OF THE EVIL LIBRARIAN is the third book in the Evil Librarian trilogy. DO NOT READ IF YOU HAVEN'T READ BOOKS 1 and 2 YET! You have been warned. Cynthia Rothschild's world is finally just as it should be. The evil librarian Mr. Gabriel has been locked up safe in the demon world ever since their showdown over the summer at theater camp. All her friends are still alive and no one's been attacked or possessed by demons for months now. Plus, this year's fall musical is going to be Les Misérables, which means Cyn gets to create the most incredible barricade set design in all of high school theater history and her boyfriend, Ryan, is sure to land his dream role of Javert. They're clearly going to have an amazing senior year. So why can't Cyn relax and trust that things are really okay? Maybe it's because meanwhile, down in the demon world, an epic mishandling of Mr. Gabriel's essence leads to his escape. The newly free evil librarian places a curse on Ryan, forcing Cyn to return to the demon world to make a deal for a Ryan's life. But what she has to do to save him will make Mr. Gabriel more powerful than he's ever been before. Will Cyn and her friends ever be able to bring down the final curtain on Mr. Gabriel once and for all? To order online: Go to the website of my awesome local indie Community Bookstore. Once there, you can select the books you want, and when you place the order, put a note in the comments field saying that you would like the books signed by the author and describing how you would like them personalized (e.g., "For Margaret," or "Happy Birthday, Timmy!"). You can also say "signature only," if you want a book signed but not personalized. You can also call the store to place your order at (718) 783-3075 or email them at info@communitybookstore.net. Community Bookstore will let me know that someone has requested signed books, and I'll head over to the store and sign the book or books per your order. If you live in the area, you can pick up the book(s) at the store; otherwise, Community Bookstore will ship them out to you. If you have any questions about how this works, please feel free to email me.